Released: November 2015. Genre: WRPG. When Fallout 3 was released in 2008, it became an instant-hit that won the hearts of many gamers, fans of the series or not, and drummed critical acclaim. An Obsidian-developed follow-on only whetted the appetite and now, more than seven years later, Fallout 4 hits eighth gen consoles. 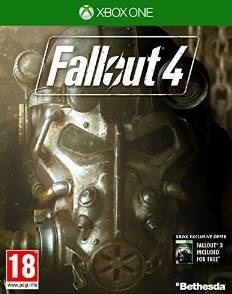 It’s a strange one, as despite being a bit technically rickety and lacking significant changes to Fallout 3’s core gameplay, it is nonetheless a compelling open-world RPG that will get its hooks into you and keep you playing for dozens of hours. While not the GOTY-worthy instalment some may have been hoping for, it’s still well worth a punt if you’re looking for a huge and absorbing RPG. Let me first clarify the game’s technical shortcomings: Fallout 4, despite being one of the most hyped AAA titles of the year, looks underwhelming. It, at times, resembles an upscaled version of Fallout 3, with few impressive animations, a slight lack of detail in the world and janky overall aesthetics. The dialogue system, implemented with visual close-ups, heightens the lack of detail. There are some bright spots, such as the varied locales, gruesome V.A.T.S. animations and it is perhaps compensation for an interactive, rather huge world. Fallout 4 received slight criticism before launch for its looks, and sufficed to say, it doesn’t look as good as the system’s best. There are also a lot of minor-to-major bugs, ranging from floating corpses to controls becoming completely unresponsive until you reboot. It’s pretty unpolished. 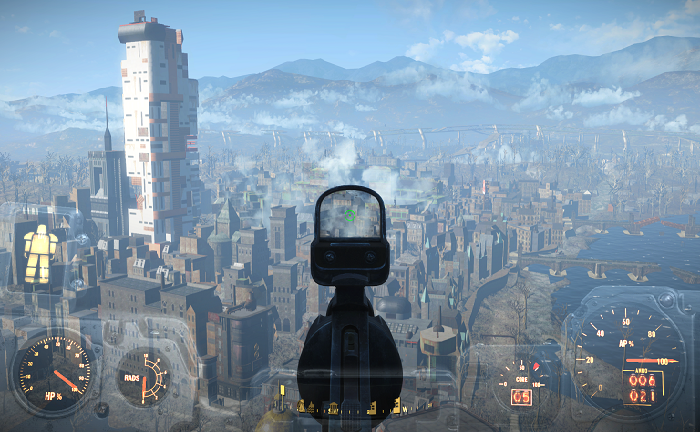 But if anything, Fallout 4 proves that you can still craft an engaging experience despite lacklustre graphics. Fallout 4 follows the tale of a Vault 111 dweller, whom at the start of the game, is living a comfortable life with their other-half and child. But things go wrong quickly, as a nuclear blast forces you underground into cryosleep and a mysterious man kills your lover and takes your child. Soon you wake up, the entirety of the world destroyed by nuclear war, and your clear objective is to track down your son. A touch bland at first, the story becomes more interesting as you go along, leading to a fairly interesting twist. It gives you a clear motivation, and the path there is the best part. The way the optional faction quests tie back into the story is also pretty sweet. "Unless you've a Neo Geo behind that clipboard, I'm not interested"
Playing Fallout 4 will seem instantly familiar to fans of the third game. Movement, whether in first or third-person, feels somewhat sluggish, though you can now sprint at the expense of AP Points. V.A.T.S. return too, allowing you to nail a gruesome kill-shot by targeting a specific limb. 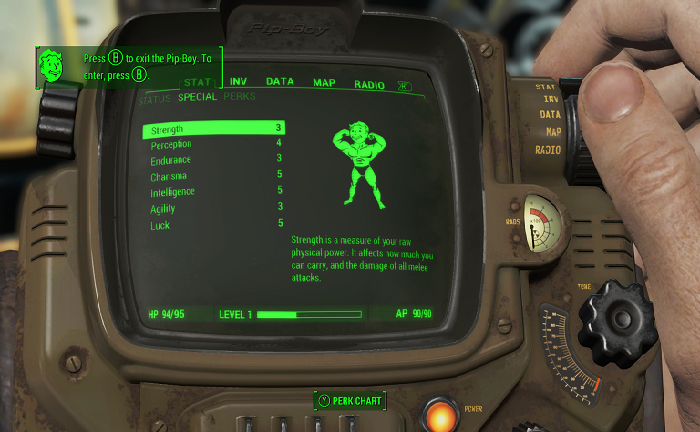 As you level up in Fallout 4, you can upgrade your character’s V.A.T.S accuracy, as well as other stats such as Endurance and Luck. This time around, you also can allocate skill points into Perks, with many returning ones such as the Sandman perk. It feels like a natural levelling system that offers a bit of flexibility. For example, you could ignore Intelligence then use a special perk which randomly drops XP, depending on how low your intelligence is. 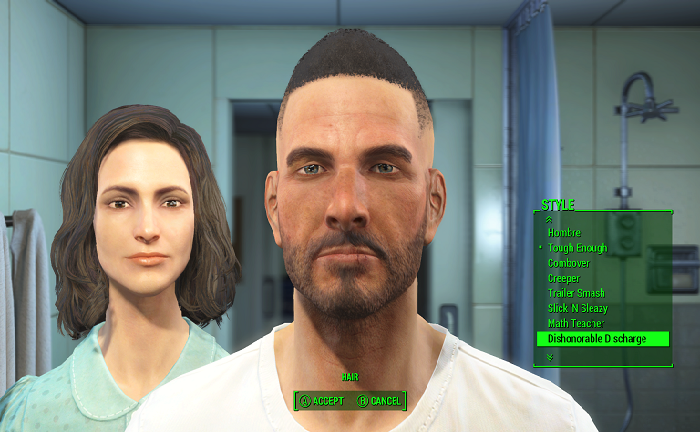 Fallout 4 is certainly an expansive game. Like before, the map has unique areas with their own distinct back stories and side tasks. As you are heading towards one mission, you may discover another one. This is certainly value for money, but it can also become overwhelming. Once you accept a mission, you cannot remove or hide it from your list, meaning you can have dozens of objectives at a time. And while some missions can be fantastic – including one where you explore a Museum of Witchcraft stalked by a Deathclaw – others are dull. Particularly boring are the Faction quests which repeat, which boil down to finding objects, recruiting settlements or saving people. If you tire of these missions, any accepted ones cannot be hidden. This leads to clutter. 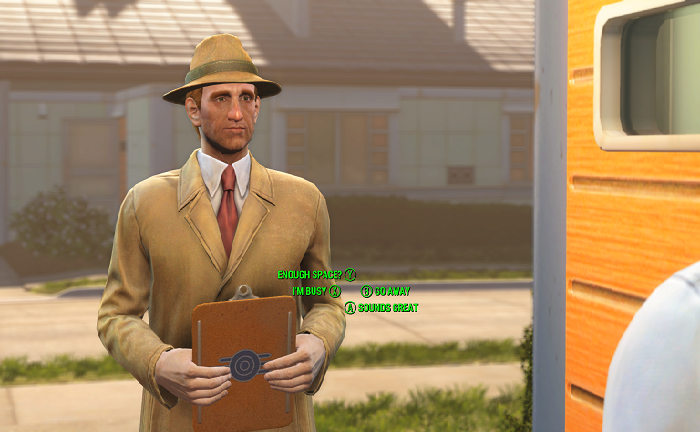 The newest – and perhaps most addictive – aspect of Fallout 4 is managing Settlements. You’ll notice that some locations on your map will contain Settlers, and these can be physically managed. 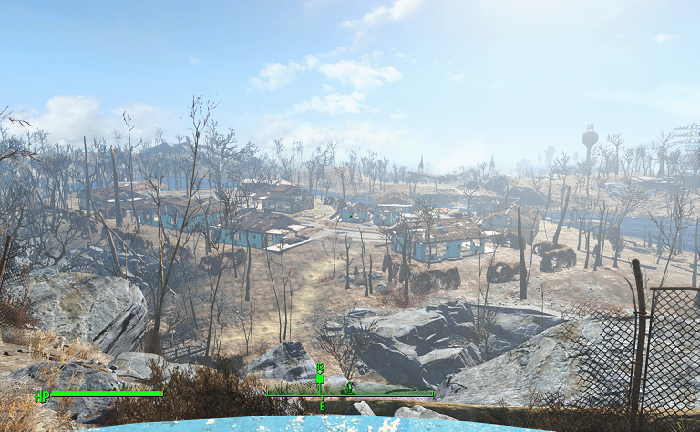 You can dismantle junk lying around the settlement, and use it to rebuild. You’re aiming to please settlements, and this involves building Food and Water facilities, Power supplies and defences (which are a necessity, as invasions can happen regularly), as well as distributing settlers in order to balance all the resources in multiple settlements. You also often recruit more settlements – usually through allegiances to different factions – meaning you can create a supply chain. It’s optional, yet deviously addictive. 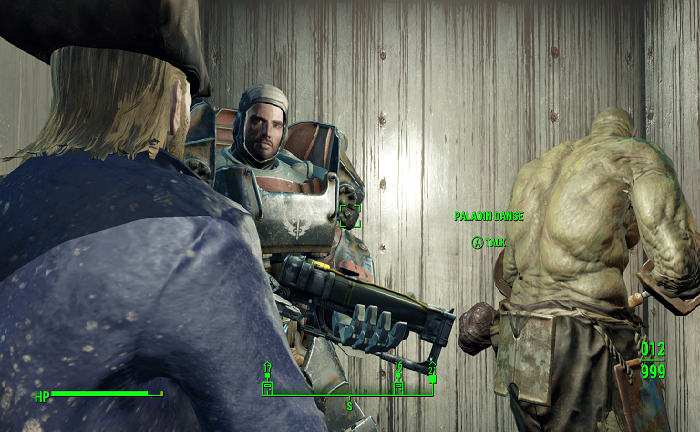 Fallout 4 also has a fair amount of choice, mainly in dialogue. The problem is that the new dialogue system is limited and odd. You’re always given four preset choices, with such basic one-word descriptions that it can be tough to actually know what you’re about to say. Sarcastic, in particular, is infuriating. You can’t tell if it’s a sarcastic agreement, disagreement or just a snappy comeback. It’s also not safe from bugs, as character dialogue can skip, cut out and pause, forcing you to listen to whole lines over again. It’s a shame, because borrowing the Faction system from New Vegas was smart. You can align with four factions, including the plucky Minutemen and series regulars Brotherhood of Steel. While the missions themselves can be lame, it’s fun to see your alignment alter and change the outcome of the final act. Inconsistent is probably the best word to describe the whole experience. As you explore the story, some characters are well written and very engaging, particularly a female reporter called Piper. But others – including the main character – feel flat. The story starts off weak, but becomes interesting after the first few hours and once you explore more faction quests. The mechanics, while a touch refined, are very similar to previous Fallouts, meaning it can feel cumbersome to move. And for every impressive locale, there’s a few more which feel repetitive and bland. But it still has a lot of Bethesda qualities, including an insanely interactive world which lets you pick up something as small as a fork, some hilarious dark humour and an abundance of engaging charm. So in the end, Fallout 4 delivers more of what you love as well as some of the flaws we’ve come to expect from Bethesda games. While certainly an expansive and engrossing game, it’s also deeply unpolished with a lot of minor bugs and underwhelming in terms of visuals. 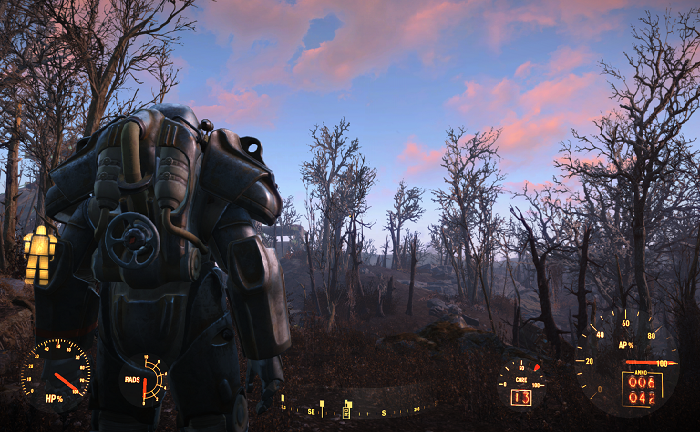 It’s smoother than a couple of Bethesda’s previous launches, but far from perfect. That being said, it packs a lot of the appeal of previous games, strikes a nice balance between Fallout 3 and New Vegas, and does offer a lot of compelling content for dozens of hours. Fans of the series will find it easier to forgive the lack of finesse, while those who didn’t enjoy previous games will not be convinced.